The wind is howling outside my windows and ice is clattering on the roof. February is such a short month, and yet sometimes it seems liked the longest month of the year. In the Midwest, we get a couple of warm days just to remind us what Spring is like, and then BOOM! The cold and snow settles back in again. I need an escape! I don’t have the money or the time for a Caribbean cruise or a trip to somewhere warm, however; my escape has to be more practical. Ed and I are both frugal people; when we decided that I would leave my full time job we knew that we could have to do without some things. We don’t have cable or satellite TV since we live close enough to Chicago to get all the network stations for free. Ed bought a nice 27″ TV right before we started dating. In my little apartment, I only had a small 13″ TV. Ed’s TV seemed so big to me when we were hanging out at his place! But now, flat screen TVs make Ed’s TV look ridiculously small. We kept waiting for Ed’s TV to die on us, but that old clunker kept right on giving us a great picture. So we hung on to it for a while longer. Finally, however, I decided I wanted something just a little nicer. On my birthday, Ed and I went shopping for a new TV. We bought a 40″ Smart TV! Now Ed and I have very different TV watching styles. He can only sit still for about 30 minutes. I could watch TV all day long. He likes comedy; I like dramas. He likes baseball, I do not. So when it comes to watching TV, I have some shows that I watch on my own. He’s not allowed in the room while I’m watching The Good Wife, because he’ll criticize something about the show and make me mad. I watch Revolution on Thursdays, when Ed is at work and the girls are at school. I need something to do while I fold the laundry, right? But right now, both shows are on a break! What else can I do during laundry folding time? With my new Smart TV, I now have a subscription to Netflix. And I have found my escape there. It’s not the escape you might think it is, since I watch other people desperately trying to escape some horrible things. Oh, yes, I’m watching people run away from zombies, or as they are referred to in The Walking Dead, “walkers.” There’s something just so fascinating about watching the end of the world as we know it. Who survives? Would I survive? (I can be fierce, you know. Just ask that lady that cut me off in the school drop off line!) 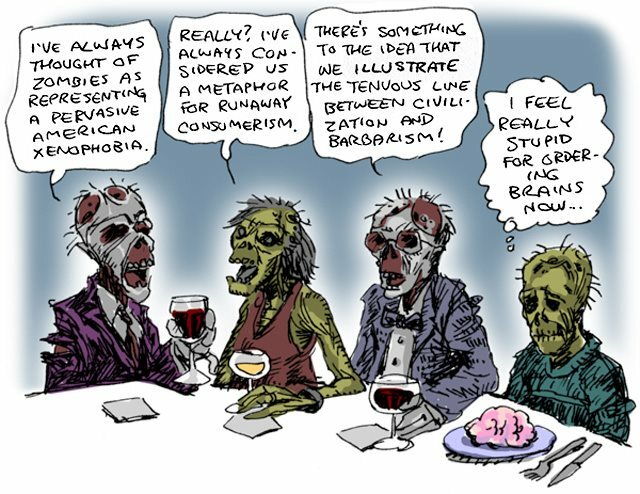 I would be so revolted by zombie’s body parts falling off that I wouldn’t last long in a zombie world. But I love watching zombie smashing on television! The only solution is to get hooked on a different show. What should I escape with next? Battlestar Galactica? (I loved the show in the 80’s…will I like the new version?) Torchwood? Firefly? The laundry must get done! What’s your escape? Link it up below or tell us in the comments! Then come back on Monday to read next week’s Spin Cycle Prompt! I don’t watch tv but now I’m thinking that might be the key to getting laundry done! We are ALWAYS behind on laundry! We do not of cable/satellite so Netflix is our only entertainment outside of broadcast tv. If you can get past the steamy naked body scenes House of Cards is good. I also like Netflix for the old Disney movies. Great for when hubby is traveling and I need a break. We watched Chitty Chitty Bang Bang a couple of weeks ago on Netflix! It was fun to see again. We haven’t ever watched anything through Netflix – I can’t really justify it since we pay for U-verse. I do love our DVR – i save my favorite shows for watching from the treadmill and when folding clothes! Kim recently posted…In Case You Were Wondering…. I love our DVR, too! We have a lot of shows to catch up on, though. They are comedies that my husband and I watch together, and the Olympics have been taking the place of our TV time! That is the best thing of living alone: I can watch whatever I like whenever I like! On a big flat screen that I got hauled all the way from the Netherlands. Best buy ever! My husband of 73 LOVES baseball. I can wait till the playoffs, thank you. TV and Netflix are my escape, too. Orange the New Black, House of Cards and so many others are enjoyable. My tablet hangs on the chest next to our bed. I go to sleep watching Netflix with ear buds every night. And we have now closed the age gap! Love the post! I want to see Orange is the New Black! I think that’s one of the shows Gretchen likes! I had to laugh at the what you said about Ed making comments during your show. I watch Law & Order SVU & CSI on the DVR early Sunday mornings because my husband irritates the heck out of me when I watch these. Either he is mocking it or just won’t stop talking. I will have to check out Netflix. I have been meaning to watch Breaking Bad. Yes! I will be watching my show, and then Ed will come home from a meeting or something and want to talk! And then he’ll say, “Do you really want to watch this?” Yes, that’s why the TV is on! YES! I’m so happy for you that you have discovered the joys of Netflix! At least you use the time to get something useful done. I usually watch it on my laptop in bed at night with my earpods in. BATTLESTAR GALACTICA! The best show in the last ten years. Seriously. I love Torchwood too, but really only the first season, after that it wasn’t as good. And YES to Firefly too, Nathan Fillion pre-Castle. Then do Breaking Bad. That should keep you busy for a while! Gretchen recently posted…Spin Cycle: Go Away! Battlestar Galactica it is! If I took my laptop to bed with me, I’d be up all night! I can’t watch TV with my husband either. He usually finds the worst movies ever made and then switches between channels every ten minutes or so. It makes me completely mental. Hmm..I didn’t like Torchwood! And it got weird. However, that’s just me! And I can’t be in the same room as Walking Dead when Cassidy watches it. I get disturbed more by the people than the zombies! They’re just annoying. tamaralikecamera recently posted…In Which Des Takes Over My Ask Away Friday. Yes, I can see that about The Walking Dead even though I’m loving’ it!